Prepared salad dressings can sometimes be pricey. This is a guide about saving money on salad dressing. Dip your fork into your salad dressing or dip, instead of dunking your food or pouring your dressing over for food. Your tongue will still get the flavor you're wanting, not tons of it, neither will your hips. Plus, you'll not have to purchase the salad dressings as often, so you'll be saving on your food bill. I save money on salad dressing by reusing the little inserts that are in the tops of some brands of salad dressings. These inserts have a hole in the top to limit the amount of dressing poured onto the salad. I just pop them out of the empty bottles with a fork tine, wash them, and push them into dressing bottles that don't have these handy little items. They come in two sizes. They are particularly helpful when pouring an oil/vinegar dressing, allowing blending of the two ingredients rather than getting an overabundance of one, and not enough of the other. And no more salad swimming in an over-pouring of dressing! I'm sure I gain about 1/8 of the dressing, and the salad tastes much better with less "goop". We buy lots of different kinds of salad dressing in our house. To save money, I pop out the insert that's in the name brand dressing when it's empty instead of throwing it away take the plastic part that makes the dressing come out slower. Then you can put it in the generic dressing bottle and it doesn't drown your salad. The new salad dressings with sprayers are pretty pricey even if you have a coupon. To control the amount of salad dressing we use at home, I do not remove the foil seal when opening the new bottle. I take a toothpick and punch several holes in the foil top. I also invested in an inexpensive spray bottle and make my own spray dressings. Why pay someone else to do this for you? 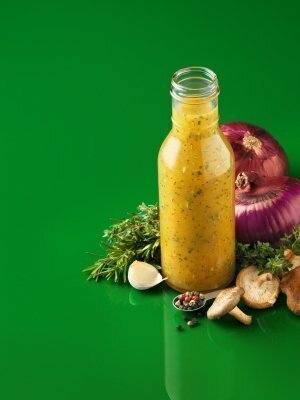 All you need to make French dressing, put ketchup in the mayo or salad dressing and mix for the taste you like. Or use mayo or salad dressing, add mustard, and ketchup for Thousand Island dressing. For this one, you can put sweet pickle relish or any other herb or onions or hard boiled eggs, if you like. Sometimes, I just use plain salad dressing or mayo on the salad. I put it on just before serving the salad. You can also mix oil and vinegar, with herbs and garlic, if you want to make a nice Italian dressing. I've found that creamy dressings are just too thick. They would put great dollups of dressing in one spot and then I would have to try to get it to spread around.